The best rumba in Cuba! Ever since the Muñequitos' first U.S. tour back in 1992, people have been asking for an album of bata music from them. 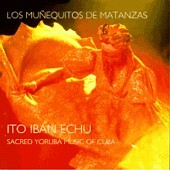 Here it is -- the music of santeria, songs and salutes to the orishas of the Yoruba pantheon. A must-have for your collection, this is an all-new recording, with gorgeous color photography and notes. All new material by Cuba's famed rumba masters in the first modern digital recording of Los Muñequitos. Even if you think you know the Muñequitos' sound, you've never heard them like this! Featuring guaguanco, yambu with cajones (boxes), and the first appearance on CD of traditional Abacua drumming, this is a great, great record. Contains: Vale Todo, Lengua De Obbara, Ese Señor, El Jardin, Abacua Makonica, No Quiero Problemas, El Tahonero, Sarabanda Kimbancero. Their 1983 Cuban studio recording. Previously released as Guaguanco / Columbia / Yambu, this album features the original version of their hit "Congo Yambumba" (known to many people from Eddie Palmieri's recording.) Digitally remastered from the original master tapes. A real discovery! Recorded in 1970, this album features 5 tracks by Los Muñequitos with legendary singer Saldiguera, and 4 tracks by the group Folklore Matancero, which later became known as Afrocuba. The Muñequitos tracks were released as 45s in Cuba, but these recordings have never before been released as an album. Contains: Los Muñequitos: Maria La Nieve / Que Vendes Tu? / Tierra De Hatuey / Oyelos De Nuevo / La Chismosa Del Solar Folklore Matancero: Arturo / La Calabaza / Cabiocile /Mañana. Qbadisk's all-time #1 seller! This essential album combines two Cuban releases by the granddaddies of rumba. With notes by Maria Teresa Linares and photos. AND DUE TO POPULAR DEMAND, QBADISK HAS RE-MANUFACTURED THEIR OFFICIAL QBADISC LOS MUÑEQUITOS DE MATANZAS T-SHIRT! Adapted from Jose Rodriguez's original artwork for the cover of OYELOS DE NUEVO (QB9013). This colorful shirt is a must for Muñequitos fans, QBADISC supporters, and stylish Cubanophiles everywhere. Printed on a white 100% cotton t-shirt, available in L and XL sizes. $15.00 + s/h. porque también soy tu hermano. From Rumba de Cajones, "Canto a Angola"